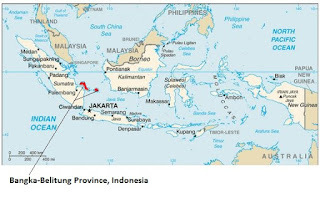 Once the world's hot spot for avian flu (see yesterday's blog JID: High Seroprevalence Of H5N1 Antibodies In Indonesian Poultry Workers), we've heard relatively little bird flu news out of Indonesia in recent years. We occasionally see reports of poultry outbreaks, but only two human H5N1 infections have been reported in the past 18 months. Yesterday, however, Crof picked up a report that H5N1 kills dozens of ducks in North Sulawesi, while this morning we have multiple media reports of an outbreak on the islands of Bangka Belitung province reportedly involving chickens, ducks, and somewhat unusually . . . pigs. While H5N1 has been detected in swine before, it has been a fairly rare occurrence. Since media reports on avian flu out of Indonesia have - in the past - not always been the most reliable, until we get official confirmation, I'd strongly recommend Caveat Lector. First a translation of one of the media reports, then I'll be back with more on H5N1 in pigs. This report appears on Netral News, but similar reports can be found published by Antara/AFP. Wednesday, October 12, 2016 | 16:37 pm | HealthMuntok, NETRALNEWS.COM - positive cases with suspected bird flu was found DHO West Bangka, Bangka Belitung province, in the district of Muntok and coconut. In Sub Muntok, bird flu was found in chickens, while in District Coconut, bird flu affecting chickens, ducks and pigs. "Officer of Health with the Department of Agriculture Farm and Ranch West Bangka Regency has checked using RDP to ensure the findings of the case and found the dead birds positive suspect bird flu," said Head of Programme Development DHO West Bangka, Yudi Widyansa in Muntok Wednesday. He explained that the examination was conducted in District Muntok in two locations: in Gang Breadfruit RT 03 RW I and in Puput precisely behind the Company, discovered the case of chickens. "While in the District Coconut Village Sinarsari examination found positive cases affecting chickens, ducks and pigs," he said. He explained that the dangerous new viruses found in animals, while from an examination of the man has not been found or negative, but it continues to supervise the residents around the scene. From the results of the examination, the entire poultry tested positive for everything immediately destroyed by burning. 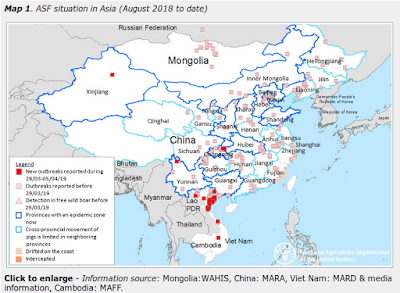 Since H5N1 infection in pigs has only been rarely reported, and not to my knowledge in recent years, I'm understandably a little leery of this report. Still, there are precedents. 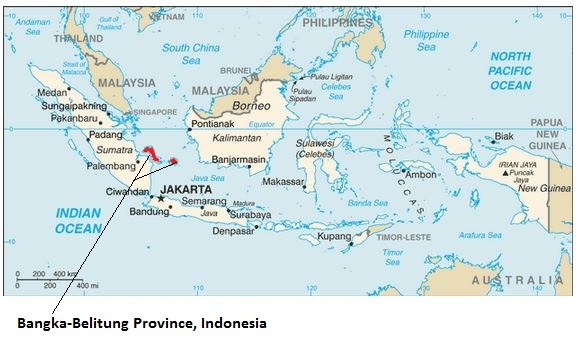 More on point, however, is a study that appeared in the EID Journal in 2010, which found H5N1 infected pigs in 4 Indonesian provinces between 2005 and 2007, but not in 2008-2009. Pigs have long been considered potential intermediate hosts in which avian influenza viruses can adapt to humans. To determine whether this potential exists for pigs in Indonesia, we conducted surveillance during 2005–2009. We found that 52 pigs in 4 provinces were infected during 2005–2007 but not 2008–2009. Phylogenetic analysis showed that the viruses had been introduced into the pig population in Indonesia on at least 3 occasions. One isolate had acquired the ability to recognize a human-type receptor. No infected pig had influenza-like symptoms, indicating that influenza A (H5N1) viruses can replicate undetected for prolonged periods, facilitating avian virus adaptation to mammalian hosts. Our data suggest that pigs are at risk for infection during outbreaks of influenza virus A (H5N1) and can serve as intermediate hosts in which this avian virus can adapt to mammals. The concerns over finding H5N1 in pigs are actually two-fold. The second concern is viral reassortment. Since pigs are susceptible to human, avian, and swine flu viruses, and can be infected by more than one virus at the same time, there is the potential for two viruses (say H5N1 and H1N1) to swap genes and produce a new hybrid subtype. Granted, this doesn't happen often, and most of the time the result is an evolutionary failure, unable to compete with the parental viruses. But every once in awhile a new, `biologically fit' virus will emerge (see NIAID Video How Influenza Pandemics Occur). The chances for genetic reassortment depend upon both the duration of H5N1 circulation in pigs as well as the simultaneous presence of human and pig influenza A viruses (such as H3N2 or H1N1). As long as human and avian influenza viruses are co-circulating - whether in humans or in pigs - the possibility of an exchange of genetic material-exists. We've managed to dodge that evolutionary bullet for a dozen years, so perhaps the concerns are over stated. But if - as the Indonesian report suggests - the H5N1 virus is circulating in local pigs, the risks are not zero. Hopefully we'll get some official statement or clarification on these reports. Very possible, which is why I put multiple caveats in this story. That said, H5N1 in pigs isn't unheard of, and if true, would be an interesting development.